App Store is a perfect place to get any kind of apps you want. 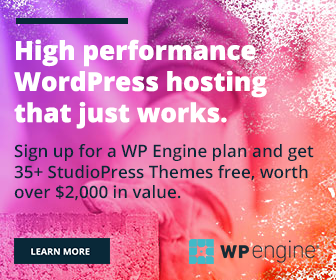 It hosts thousands of free as well as premium apps on several categories like productivity, news, health, sports, business and so on. It also features some brilliant apps to easily prepare your favorite foods or find a good restaurant in the city with iOS devices. They guide you on each stage of cooking through easy to follow instructions, provide dinner ideas and book a delicious food in advance. In this post, we pick 6 best iPhone food apps in 2019. Kitchen Stories is a gorgeous recipe app for iOS. It contains hundreds of delicious recipes across various categories and packages. The app comes with a beautiful interface and ideal features like detailed photo instructions, how to make videos, expert tips etc. All recipes are accompanied by attractive pictures and new contents are added in every week. Users can save their favorite recipes in a separate cookbook for future reference. It will automatically generate a shopping list for you based on the reminders set. Inspiring food stories is another notable feature that makes you aware of the latest food trends and experiments from the experts in the field. 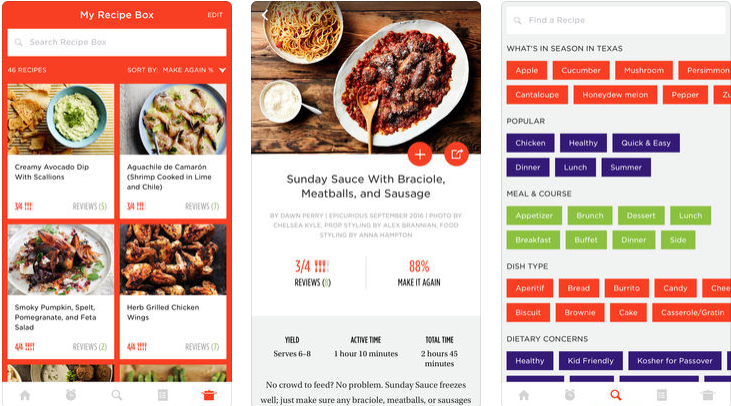 Urbanspoon is a free app to find the best restaurant in your area. Browse food guides & restaurant reviews around the globe, browse menus, make reservations and much more with the app. It allows you to share own opinions about the dining experiences and read reviews from foodies, critics etc to filter your search on the go. It has a beautiful design, interface where recipes are displayed under different heads like breakfast, lunch, dinner, drinks, and nightlife etc. So you can easily locate a favorite item from the list. Follow others to get updates from them, save recipes & view recommended foods to explore and cook. Epicurious is another destination to find popular recipes & the latest trends through iPhone and iPad. Explore thousands of recipes, watch cooking videos, read reviews and save a favorite item into your cookbook. Know exactly how long it will take to cook an item and easily create a shopping list of ingredients to prepare your next meal. It also lets you know about seasonal foods in an area and finds recipes by meals type, dishes, diets, and popular tags. Epicurious guides you with detailed instructions and step-by-step photos for each of them. How to Cook Everything is an ideal app for beginners as well as experts in cooking. If you are a beginner, it will teach you the basic kitchen tips and lessons to make you familiar with the process. It showcases mouth-watering recipes in an enhanced layout and delivers a matchless user experience to the cooking lovers. Users can easily create shopping lists, follow timers throughout the recipe steps, add own notes to it, print recipes and much more with this app. It also allows you to share your cooking experiments with friends and social media followers. This is an excellent source of home cooking recipes. It contains thousands of recipes with step-by-step making instructions and videos. Browsing for a favorite dish won’t be a difficult task for you. Users can search by keywords, filter results by dietary needs and hide foods that you don’t like. 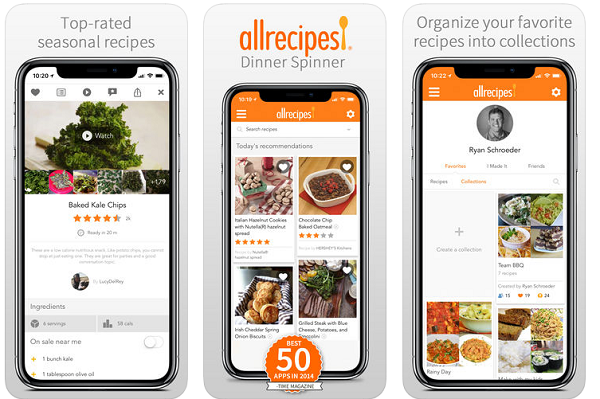 Allrecipes Dinner Spinner app also allows you to save a recipe for quick access. All recipes come with ingredients list and let you know where will you get them in the nearby area. 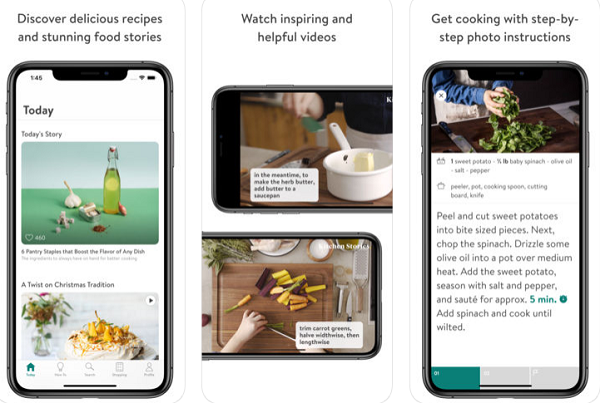 It is a lovely app for cooking lovers where they can create profiles and show created, saved recipes in one convenient place. The collections can be shared with your friends and on Facebook feed. Find calories and other nutrition facts for a food product, manage your food habits, get exercise tips to lose weight- everything with a single iOS app. Calorie Counter & Diet Tracker is a simple app to track and manage your diets from a smartphone or gadget. Just scan the barcode of a food item to know everything about it including calories, fat, sugar, cholesterol, fiber etc. It works with over 50 devices & apps like Apple Health, Fitbit, Runkeeper, MapMyFitness, Runtastic and so on.